In 2009 The 300 Committee Land Trust (Committee) and the Conservation Commission requested and received a grant of $350,375 from the CPFund to support a $1 million Town purchase of 6.87 acres to permanently preserve an open space conservation area overlooking the Coonamessett River and fresh water Pond 14. The Coonamessett is Falmouth’s longest river and Falmouth’s most important run for alewife and blueback herring. It is also adjacent to working cranberry bogs and agricultural lands. The Bartolomei parcel was a key link in the Town’s goal of preserving the corridor for water protection, wildlife, and public access to the river from Coonamessett Pond to Great Pond. The property offers wildlife habitat, water resource protection, scenic views, public access to the river, and linkage to existing conservation land such as River Bend Silo Conservation Area, the George Souza Preserve, the Dupee parcels, the Toner parcel, and the Matt Souza parcel and Coonamessett Reservation. The parcel also benefits from an existing paved driveway and parking area and a level grassy area near the water. It invites walking, picnicking, bird watching, canoeing, kayaking and fishing. 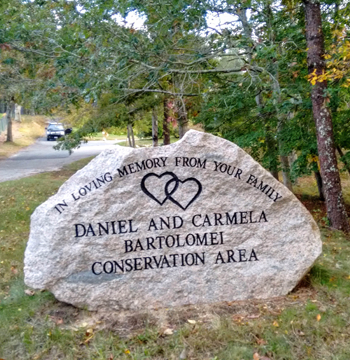 The 300 Committee reached an agreement with the Bartolomei family in December 2008 and assembled funding for the purchase from its members, the CPFund, and state reimbursement funds (Massachusetts Office of Energy and Environmental Affairs LAND grant). The purchase was completed in 2009 and the Committee began work to prevent erosion and sedimentation, maintain a vegetated buffer to the river including additional planting as necessary, and improve vistas through selective pruning. The Committee planned over time to install ADA-compliant trails for access through the area to handicapped visitors, viewing stages along the trails, a picnic area, river access for fishing, boating and kayaking, and educational signage. The Conservation Commission holds jurisdiction and management responsibility for the property, and the 300 Committee provides ongoing land stewardship important to the protection of the water resource and adjoining wetlands. With a second CPFund grant of $10,000 in 2009, the 300 Committee installed ADA-compliant accessible trails and a picnic area. The Bartolomei Conservation Area comprises a variety of terrains and habitats within the riparian corridor: river and pond shore, stream, natural vegetated wetlands, and upland habitat including a mixed hardwood forest and pine woods at the top of a ridge that runs parallel to the river. A partial species inventory produced by committee members includes Sweet Gale, willows, Tupelo, Red Maple, Sweet Pepperbush, Swamp Azalea, Black Oak, Lowbush Blueberry, Huckleberry, Wild Sarsaparilla, Sheep Laurel, Inkberry, White Oak, Pitch Pine, American Holly, Lady Slipper Orchid, Sweet Fern, Viburnum, Wild Cherry, Cow Wheat, Virginia Creeper, Little Bluestem Grass, Ox-eye Daisy, Autumn Olive, lichens, Poison Ivy. Also Sharp-Shinned Hawks, Red-Tailed Hawks, Ospreys, wild Turkeys, Turkey Vultures, Cormorants, Mallard Ducks, swans, Saw-Whet Owl, Cardinal, Great Blue Heron, Egrets, gulls, Garter Snake, Painted Turtle, Eastern Box Turtle, Snapping Turtle, Muskrat, White-Tailed Deer. Fish: Alewife, Blueback Herring, American Eel, Pickerel, Large-mouth Bass, Bowheads, Suckers, Blue Gills, and Pumpkinseeds.